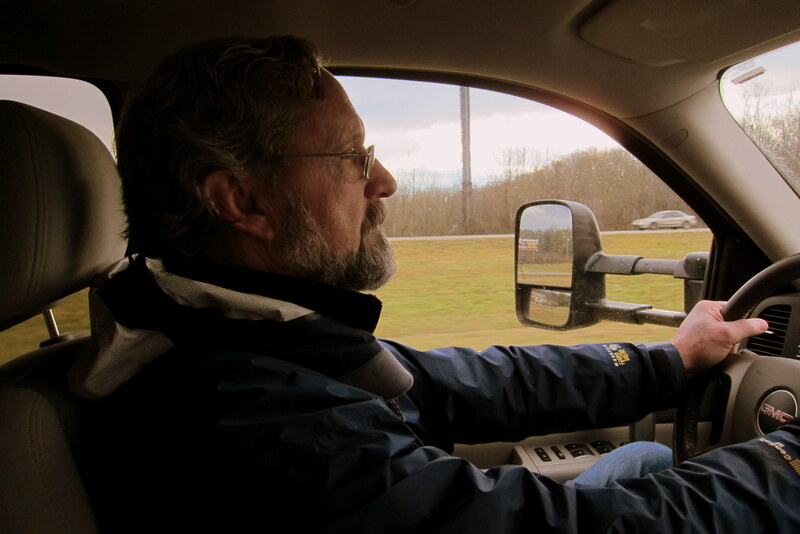 Monday, January 9, 2012: Up, dressed, hitched, loaded (well Kit was loaded…..I tried to stay sober) and on the road by 0415!!! What an ungodly hour on a winter’s morning to be up and about, you say? Well we discovered last year that leaving early allows us to miss the commuter traffic in Boston (AM) and in New York (PM). So why today, you ask? Well, we had some very enjoyable social engagements this weekend. And it’s likely that tomorrow would have been a madhouse on the roads, what with all those republication candidate’s exiting New Hampshire and heading to South Carolina…..so today is our window of opportunity! Speaking of politics…..I’m no student of the silly game; however we should think about that former Massachusetts governor who was honored by having a prestigious technology institute in Cambridge named after him. That dude’s got some clout…..or at least a lot of money! 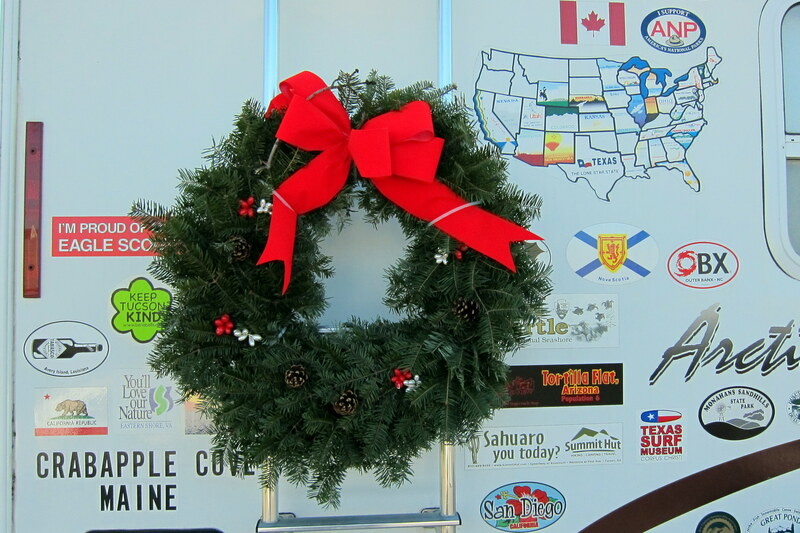 Yesterday, I removed a wreath from the house next door and affixed it to the rear of our trailer. When it turns brown…..we have found our winter home! It is a clear cold morning with a full moon, perfect to begin our fourth annual winter RV trip. We generally stick to the Interstate Highway System the first few days to get south and warm as fast as possible, hence the quote selection for this issue. We follow the traditional New England Snowbird Route and whiz (well not continuously…..however at our age, we do stop often) through New Hampshire, Massachusetts, Connecticut, New York, New Jersey and on into Pennsylvania. 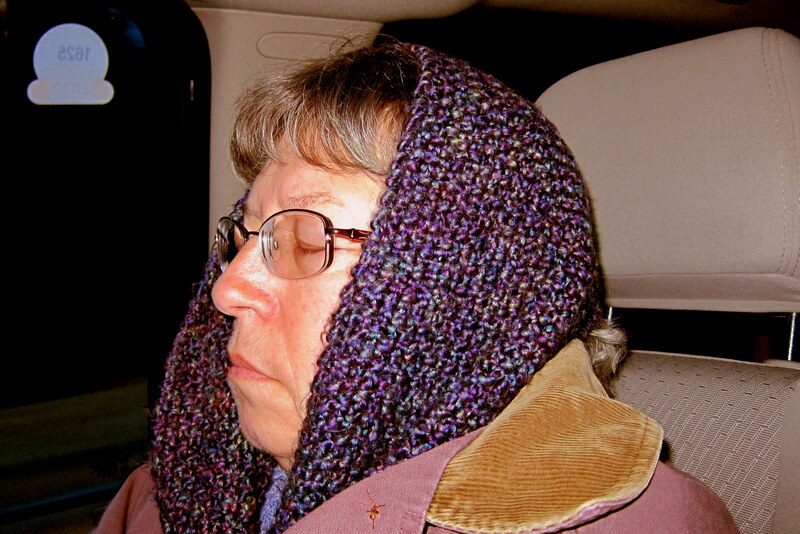 Not to be alarmed…..she wakes from time to time to tell me how to drive, or to contradict Lucy. (Remember Lucy the GPS?). Well the old girl is showing her age and is beginning to suffer from CRS. Lucy, not Kit…..Kit’s still as perfect as ever……honest, just ask her. Just heard on the radio that today would have been Elvis’s 77th birthday, wonder how he would look today…..you know, had he lived. On I-15S traveling through Connecticut as we pass the exit sign for Yale University, the finest institution in the country…..if you seek an advanced degree in hollering. A few miles further we spotted a topiary sign on a hillside that spelled “Hubbell”…..at least I think it said Hubbell, couldn’t be sure as it was a bit out of focus. At 1108 we crossed the Hudson River by way of the Tappan Zee Bridge. The river looked a bit funny, as if people had been polluting it for hundreds of years. Wonder if that is where the NY folks dig their clams…..could account for the unusual look of the Clam Chowder sold here about. A rather unique toll collection scheme has a tool booth only on the eastern side of the Tappen Zee Bridge. Since we are heading west and will likely return in 5 months through Canada…..we make out! At 1325, we decide to pull off the highway in Clinton, NJ for lunch. Since Kit has been such a trooper about getting up early I treated her to a fine meal at a nice Irish restaurant. Ron, the owner, agreed to sit for a photo op. Nice quiet fellow, however he had a rather plastic personality and was flashing a fake smile. And check out his Afro and bright yellow Leisure Suit…..so 70’s! At 1630 we entered the town of Carlisle, Pennsylvania and decided to call it a day. Couldn’t call it a night as it was still daylight. After picking up some Subway sandwiches we locate a very nice Fairfield Inn and scored a military retiree discount. In addition, they assigned us a room overlooking where we parked the rig for the night. Tuesday, January 10, 2012: Up and on the road at 0825 under clear cool skies. Had to scrape some frost off the windshield with my ID card. No ice scrapper onboard…..removed it and the snow brush last week….no sense tempting fate. Jumped on I-81S where we continued down Pennsylvania and then rolled through Maryland, West Virginia, Virginia and on into Tennessee. It always amazes us that we can travel 11 states in the first 2 days of these trips. Out west it might take 11 days to travel through 2 states! We are enjoying an easy day of traveling; however there are reports of a storm system to the south of us. 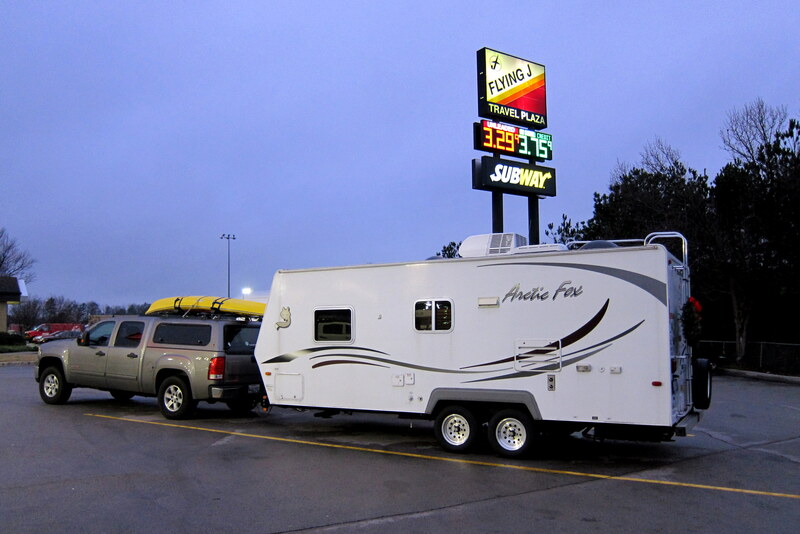 At 1730 we pull into the small town of Blountville, Tennessee and since it is 53 degrees we decide to try camping. Finding a nice little grocery store, we stock up and head for the Rocky Top Campground (yep…..that song stayed in my head for days, if you must know). In years past we stayed in motels for 2 or 3 nights due to cold temperatures. However with overnight lows predicted to be in the mid 40’s we decided to re-commission the trailer and go for it. 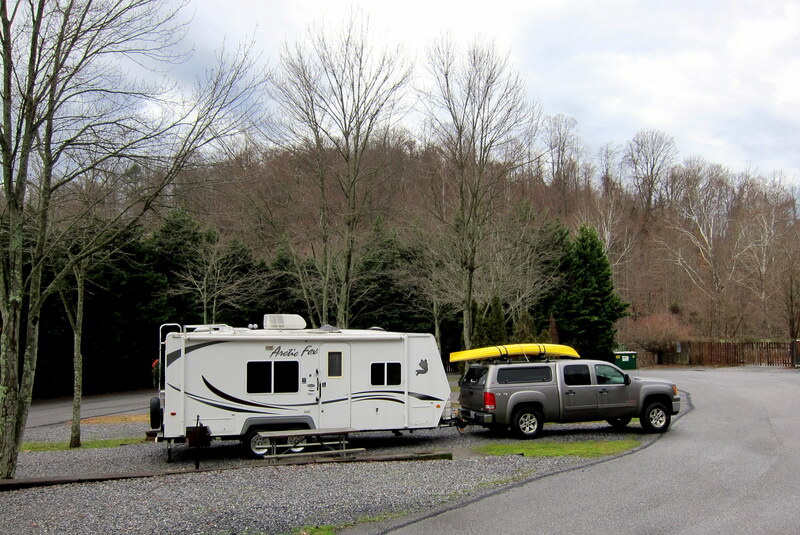 The campground was sparsely populated and we were able to score a special “winter rate”. The trailer is a four season unit with heavy duty insulation, thermo pane windows and heated holding tanks. However since I winterize her in October we usually don’t start camping until we reach Georgia, Alabama or Mississippi. The unseasonably warm temperatures allowed us flush the anti-freeze from the pipes and start a few days early. 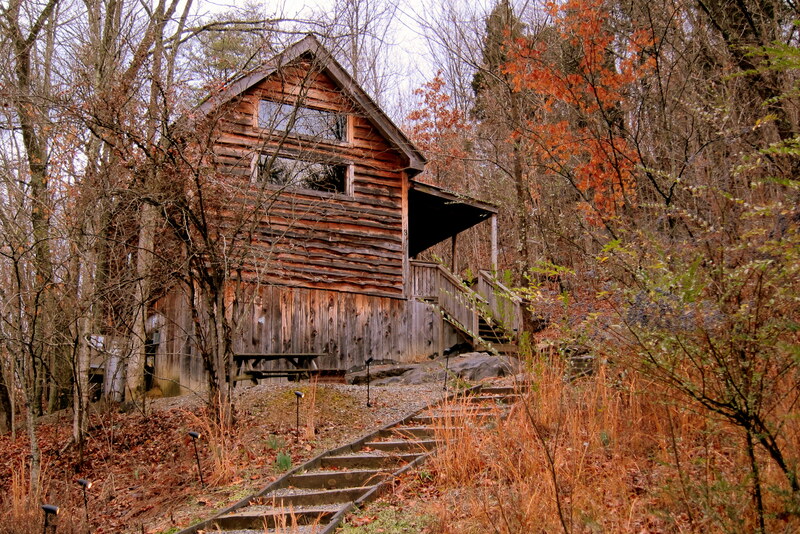 Wednesday, January 11, 2012: I am up early and took a walk around the campground and into the surrounding woods. I soon came across this neat cabin high on the hillside. Fearing a shotgun welcome, I didn’t approach any closer. However it looks like cabins you would find along the rivers of northern Maine. Returning to our campsite I noticed a shiny penny lying on the ground which I picked up and pocketed. Not being overly superstitious, this discovery had little meaning…..however the events of the day caused me to think otherwise. Back on I-81S we merged onto I-40W toward Knoxville, Tennessee. The temperature had risen to 56 degrees and the sun was shining below dark and ominous looking clouds. Arriving in Chattanooga, we moved onto I-59 crossing the northwest corner of Georgia and entered Alabama at 1355, where we confronted the Central Time Zone. About an hour later, Kit noticed a billboard above the trees that indicated a Wal*Mart close by. She felt an overwhelming need to support the protestors in New York and decided we needed to stop so she could Occupy Wall*Mart. Bill walked laps around the parking lot as Kit gathered up all the must have things that apparently aren’t sold in our hometown Wal*Mart. Needless to say, I’ll pick up every penny I encounter from now on. Besides, as pensioners, we need the extra cash. 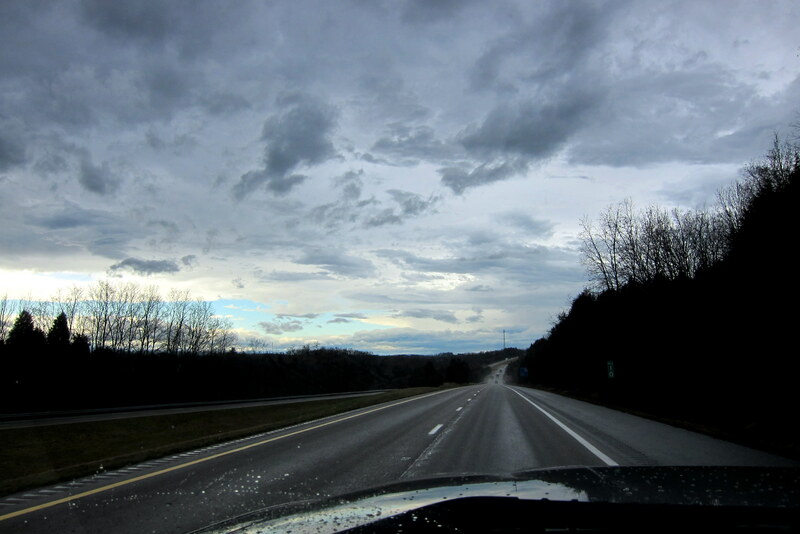 Thursday, January 12, 2012: After a restful evening, we are on the road at 0705 under cloudy skies and a temperature of 47 degrees. Pulling back onto I-59S, we cross into the state of Mississippi a few hours later. In years past we head to the Mississippi gulf coast and then travel US-90 west through Louisiana and points west. However since the weather is so temperate, we decided to travel more southwesterly. So, just outside the thriving town of Chunky, Mississippi we merged onto I-20 heading west. At 1030 we stopped for fuel and a break and I was able to acquire my first treat of regional cuisine on this trip. However, I couldn’t decide between the Cracklin, the boiled peanuts or the salt and vinegar pork rinds. The gas pump jockey recommended the pork rinds and a wise selection it was. A flavorful bouquet escaped as I opened the plastic bag and the subtle flavor of dried pig skin dusted in salty vinegar danced on my palette as I enjoyed each and every morsel. The experience was so complete that I immediately lost three front teeth and had an overwhelming desire to date my sister. In addition, living in a 22 foot trailer for the next few months all of a sudden seemed normal! Rolling through Vicksburg at noon we encountered a brisk headwind which lasted the rest of the day. Our average MPG of 10.5 at our average speed of 55 MPH dropped to the mid 7’s…..Yikes! We soon crossed the Mississippi River and entered the state of Louisiana. Stopping at the welcome station we enjoyed some complimentary coffee and retreated to the trailer for lunch. Hours later, as we neared Shreveport, Louisiana we were both getting a bit tired. It was 1600, it has been a long four days of constant travel, and we needed a break. Fortunately Kit noticed a sign for Barksdale Air Force Base so we took the next exit, parked and looked up their number. 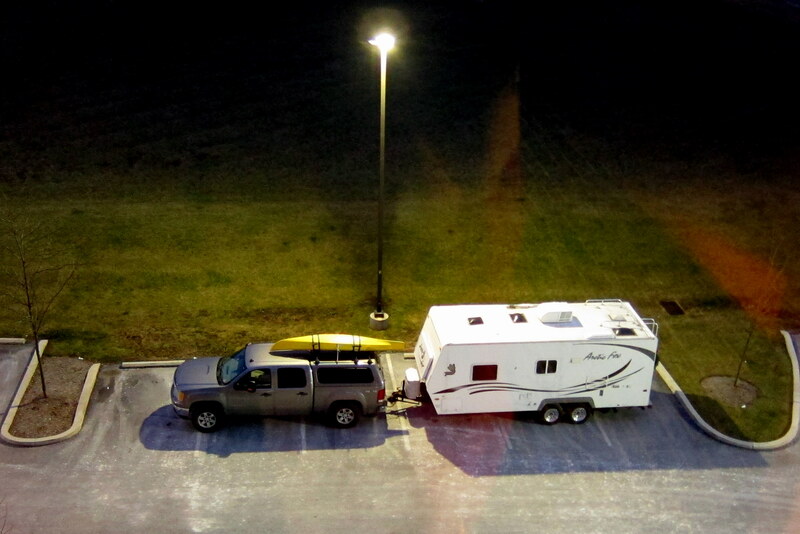 Sure enough, they have a campground and had a few spaces available. Pulling in we set up for the night and just might stay another. Oh, and before we close, it turns out that Charles Kuralt wasn’t completely right…..there are things to see as one travels the nations Interstate Highway System. Items I guess I’ll call “objets d’art”…..various human belongings that have been lost or cast off by the motoring public. We are keeping a list of these unusual treasures and will publish it at the end of the trip. Also, of course, we encounter many mortal remains of hapless woodland and desert creatures that have tempted fate by crossing the road. These we will not keep track of in deference to their families and to our readers sensitivities. Suffice it to say, if it slithers, crawls, walks or flies…..it has met its doom on the nation’s highways. Actually I have a theory…..a couple of critters are standing alongside the highway, one sez “bet you can’t make it”, the other sez, “Oh yea, here hold my beer and watch this”. Kit’s Corner: So, we’re off on another fun winter getaway! How is it that most people go to fancy resorts with nice duds and we make our way around the US noticing all the weird things? Must be due to the pilot. And, he can pretty much make anything funny! One thing I did see along the way that he missed was a huge Santa Claus in a cluster of trees, it looked like it was made out of paper mache but it had to be something different. Anyway, his head had been knocked off and was sitting on the ground. Didn’t get a picture but it was a funny sighting. I was wondering what had happened to your stories of the journey?! Thank you for sharing with me. Looking forward to lots of pics and lots of stories!! Thanks for the nice comment…..stay tuned for more foolishness. You got out of Dodge just in time for some more snow and the coldest temps of the season. Enjoy Texas! Thanks…..we will. Let us know when all the snow and cold temps are gone and we will head home. Thanks for the nice comment…..see you in the spring! SAY! WHEN YOU PARKED AT THE FAIRFIELD FOR THE FIRST NIGHT, HOW COME YOU DIDN’T PARK WITH THE SIDE DOOR FACING THE MOTEL?? SAFER DIRECTION I THOUGHT. FUNNY HOW A THIEF THINKS. HUH? LOOKING FORWARD TO THE NEXT IN THE ADVENTURE SERIES. 8 INCHES OF SNOW HERE THURSDAY 1/12 I WAS DUCK HUNTING IN MASS SO MISSED THE STORM AND SHOVELING. Let us know when all the snow and cold temperatures are gone and we will return home. We were anticipating the next trip. Love it. PS – you passed right by Donny Byrnes in York, PA off 81 S. Don’t forget the newest possibility in Cary, NC (Raliegh, Chapel Hill, Durham area). Thought we might be near Donny, however it was still too cold to stay in the camper. Thanks for the kind offer to dooryard surf…..we may very well take you up on it! Enjoyed reading your post. Yes, those pennys are lucky. Doesn’t matter whether you believe or not. Just happens. Will be following your adventure. We are in Fulton/Rockport Texas and enjoying it. Will be here for at least another month if not longer. Spent some time in that area last year before heading to Del Rio and Big Bend NP. We are heading more westerly this year out of Austin. Thanks for the nice comment! Love your wit, Bill….am sure Kit appreciates a good sense of humor on long journies….we traveled 7,819 miles from Bend Oregon to Yuma, via Branson, MO, Illinois, Indiana, Kentucky, Tennessee, So. Carolina, Georgia, Florida…..Alabama, and then picked I-10 to travel through Louisiana…first time for us! Long long journey through Texas, and New Mexico and back to Yuma, AZ…BLM Long Term Visitor Area, Senator Wash…which is our winter home. Stop by sometime..we are in the Arctic Fox 27FL 5th wheel!! Travel Safe!! Thanks for the nice comment and for the invite. We may very well take you up on it! Ready for some entertaining reading as you travel and “comment”. Took our coach to Charlotte RV Center and put it on consignment this morning. Be safe and say “hi” to Sandy, if you get a chance, while you are in Tucson. Greetings from Brunswick. As your new neighbor back home, this is my first exposure to your travel blog. I may not be able to read the next one. I nearly chocked on my beer laughing so hard at the account of your first week. You need to post a disclaimer that reading your journal could be dangerous to one’s health. Coincidently, I too found a random penny on the floor today. To my surprise and profound disappointment, it did not help me to win the Tri-State Megabucks. Maybe I should buy a lottery ticket next time before whining about not winning. Hope you enjoy the pork rinds and the warm weather in the Deep South. We are in the frozen grip of a cold snap here in the Deep North, though the forecast is for temperatures to leap back above freezing this week with snow showers predicted. Welcome to climate change. Probably Al Gore’s fault. I hear he is to blame for this Internet thing too. And I think he dreamed up the Interstate highway system you are enjoying, though I may have read that online, so it isn’t necessarily reliable. Though I do not know Kimber yet, I have not noticed any extraordinary activity at your house this week. So I guess the annual partying has not begun. Meanwhile, rest well. Thanks Jym for the nice comments and for the added anecdotes. We appreciate getting comments on the website as they then become a permanent part of our story. 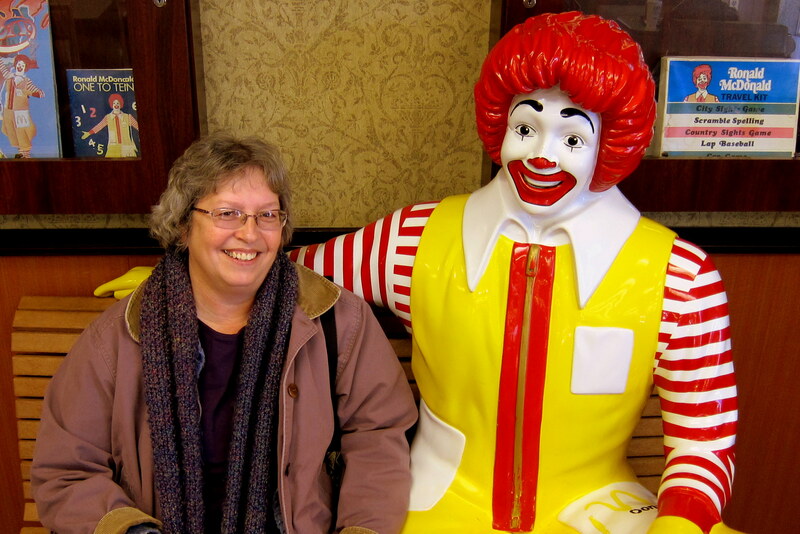 Kit and I started our winter travels in earnest after retiring in 2008. Initially the blog was a way to keep family appraised of where we were and what we were up to. However word of mouth caused our readership to grow from 13 to over 150 folks…… all in all, a bit humbling. Considering your environmental work you may be interested in a close encounter I had with Edward Abbey. A few years ago while hiking in the Coronado National Forest of southern Arizona we reached the summit of Anascosa Peak and found a fire tower that had been staffed by Ed back in 1968. His writings and drawings were still on the walls. It is a wonderful irony that Ed Abbey would leave graffiti in that fire tower. In the fall of 2001, I spent a couple of weeks roaming conservation areas throughout southern CA and UT. I ended up in Arches National Park in late October. During the trip, while camping out, I had been re-reading for the first time in thirty years Abbey’s remarkable rants Desert Solitaire. I finished the book in my tent by the light of a full moon at midnight on Halloween. The next day I tracked down where he had lived in the park to pay my respects. Sounds like you two are off to a great start on your travels. Keep up the running interary for all of us still stuck at home. Enjoy! We are and we will…..thanks! okay so you were north of Birmingham and did not make a pit stop in Huntsville!!!! 😉 Y’all be safe as you travel and have fun! Look forward to following you on this trip!!!! Thanks…..we will. Never know for sure where our whim may take us, however if we get your way on the return trip we will contact you. Enjoyed reading of your adventures….have a fun winter. Sounds like you’re off to a good start. Love your sense of humor Bill….hope Kathy likes it also or it could be a long walk back home for you……Take care and have fun!!! Marcelle & Ralph…..see you at IPOA when the weather warms up. Thanks…..you too! Hope the rest of the winter is kind to IP and we all gather there in the spring. I’ve been a bit funny for some time, however I have to work at senility, and so do I.
Yea you are…..I always laugh when your mom reads your daily Facebook post’s…..so we are even! Looking forward to seeing you all in a few weeks!!!! It’s great hearing about your adventures again! You guys just make me smile…. What an adventure it is starting out to be….looking forward to reading about it all! Thanks…..we look forward to seeing you all in Prescott if the wind blows us that way! It was 76 degrees and sunny in west Texas today! Heading into Arizona in a few days!! Bill and Kit: Sorry that you are missing the wonderful “wintry mix” the weather angels are tossing at us in Maine. Today, I spent an hour shoveling slush from the driveway before it solidified into a jagged iceberg. I prefer powdery snow in January in Maine, but if we cannot have that, can you FedEx some sunny Southwest warmth here? Not to be unneighborly but we worked hard for this warmth…..however, I just ordered a Frisbee sized snowflake to be delivered from Montana via USPS. Enjoy!